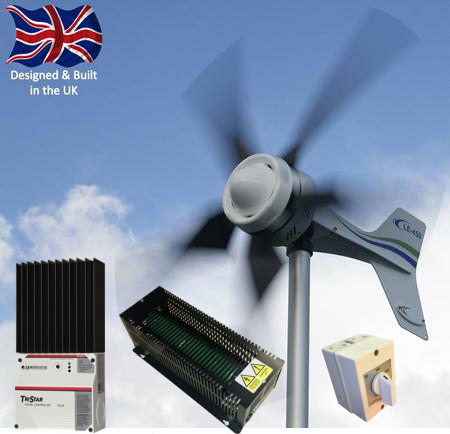 For 12V, 24V or 48V systems, this bundle of equipment includes the 450W wind turbine, the LE-450, and provides a flexible renewable energy system that may include other sources of renewable power such as solar. The LE-450 wind turbine is a compact 1.0m Dia wind turbine that produces 105W at wind speeds of 8m/s (18mph). The Tristar 45A diversion charge controller is used to divert excess power to the 500W Dump load when the batteries are full. A dedicated solar charge controller should be used for the PV with both the wind turbine and PV connected directly to the batteries. Please note the LE-450 is not suitable for locations where the winds regularly gust to over 18m/s (40mph). Mount the turbine on a standard scaffold pole (50 or 48.3mm outer diameter). We recommend the Guyed Tower Kit, everything you need (guy wires, earth anchors, foundation plate etc) except for the pole which you source locally.